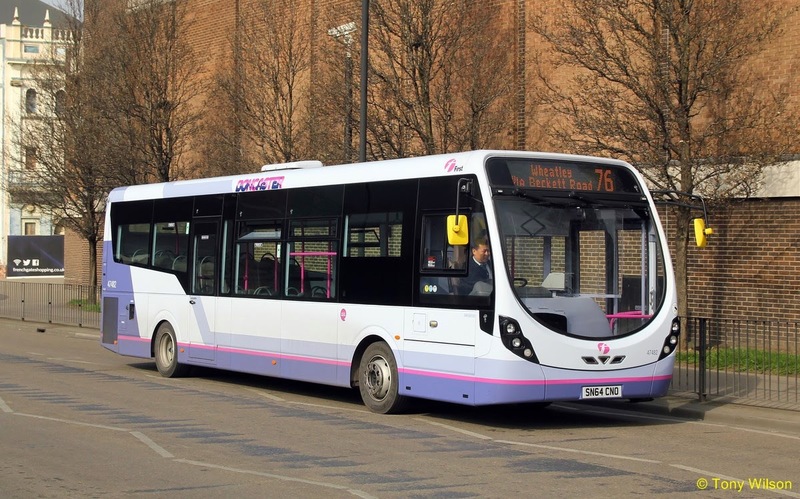 FirstGroup plc (the "Group") has issued the following update in respect of trading for the financial year ended 31st March 2015 (the "year"), ahead of preliminary results due to be announced on 10 June 2015. "Overall trading for the year is in line with our expectations and we continue to make progress with the multi-year transformation plans, which will improve the Group's financial performance and ensure we deliver sustainable value creation in the medium term. "The pricing improvements we made in the 2014 bid season together with further cost savings mean we expect to make solid margin progress in First Student for the year, and we are also encouraged by the results achieved at this stage in the 2015 bid season. In UK Bus we continue to deliver passenger volume growth, positive yield and further cost efficiencies. Greyhound has flexed mileage, timetables and pricing in response to the rapid reduction in passenger demand from lower fuel prices and is on track with the yield management programme, while our First Transit and UK Rail businesses have maintained the good growth momentum and margins achieved throughout the year. In recent weeks we were delighted to secure a contract to operate the Great Western franchise for up to four and a half years, and will continue to work closely with the Department for Transport and Network Rail to deliver the £7.5bn Great Western Mainline modernisation programme. We have also signed an agreement to run the TransPennine Express franchise through to 1st April 2016, and look forward to submitting our bid for the new franchise later in the spring. "In early March we were pleased to announce that Wolfhart Hauser will join the Board of FirstGroup in May, and will become Chairman following our AGM in July. Wolfhart has an exemplary track record of sustained value creation and his experience and counsel will be invaluable as we drive forward the transformation of the Group. I would also like to thank John McFarlane for the important contribution he has made during his tenure and wish him every success as Chairman of Barclays." planned. The full benefits of our pricing strategy and cost savings will be partially offset this year by the adverse weather conditions in the North Eastern US in the fourth quarter, but despite this headwind we expect to deliver margins of approximately 7.5% for the year, and are confident of delivering our double digit margin target in the medium term. As previously indicated, First Transit has achieved organic growth on existing contracts in the second half that was towards the top of our planning range. As a result US Dollar revenue growth for the year is expected to be 5.5%. We continue to expect margins of around 7% for the year and into the medium term in this low capital intensity business. In the fourth quarter, Greyhound's like-for-like US Dollar revenues are expected to decrease by 5.5%, reflecting the adverse effect on customer demand from sharply lower fuel prices, which improves the affordability of other forms of transport for some trips compared with Greyhound. As a result US dollar revenue for the year is expected to be flat. Greyhound is actively managing mileage, timetables and pricing in response to changed market conditions. Given recent levels of activity we expect margins for the year will be modestly below the prior year level. Greyhound Express revenues have been more resilient, with like-for-like US dollar revenues expected to increase by 3.0% for the year. Our project to roll out real-time pricing and yield management capabilities across our nationwide network continues to progress as planned and we remain confident of achieving our 12% margin target, recognising that long term oil price trends may impact the timing. target of double digit margins. We believe that our strategy, which is based on delivering a competitive customer proposition coupled with improved operating discipline and strong partnerships with local authorities, is the most responsive, efficient and cost-effective way to deliver the outcomes that bus passengers and taxpayers want. Our confidence is reinforced by the validation of our efforts to improve our customer proposition as measured in the recent Passenger Focus survey of bus users across the UK - particularly on value for money, where our score has improved by 17% over two years and is now above the national average. Strong demand continues to drive passenger volume and revenue growth in our rail business, with like-for-like passenger revenue expected to increase by 6.6% for the year, at the top end of our expectations. We recently signed an agreement with the Department for Transport ('DfT') to run the First Great Western franchise to at least 1st April 2019. The franchise will see new or refurbished trains on every part of the network, resulting in more frequent and faster journeys and an increase in the number of seats over the period to the end of the decade. We also recently signed an agreement with the DfT to run First TransPennine Express for an additional year to the start of the next competitive franchise, expected on 1 April 2016. We continue to progress our bid proposal for that competition, which will be submitted towards the end of May. We have been, and will continue to be, disciplined in our approach to bidding for UK rail franchises which aims to balance appropriate returns at an acceptable level of risk. We expect a total cash outflow for the current financial year of up to £100m, which is principally due to the cash outflow of approximately £70m associated with the end of the First Capital Connect franchise in September 2014. As previously indicated, we expect net cash flow for our next financial year to be broadly flat excluding an outflow of approximately £60m associated with the end of the ScotRail franchise. As our plans continue to drive improvements in our returns, we expect the sustainable cash generation of the Group to increase over the medium term, which in turn will allow us to continue to strengthen the Group's financial position. We are part way through a multi-year programme of investing at an increased rate in our businesses to support the turnaround in financial performance, and over time we expect our financing costs to continue to reduce, as cash generation increases and our relatively high coupon bonds mature.